This paper was presented on my behalf at the Caribbean Studies Association annual conference held in Havana, Cuba in June 2018. 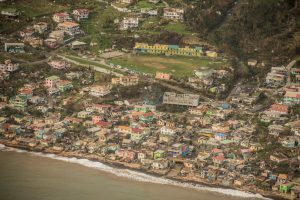 On September 23, 2017, a mere five days after Hurricane Maria pummeled through Dominica and left the world wondering if hundreds or thousands were dead, the Prime Minister, Hon. Roosevelt Skerrit went to the United Nations General Assembly to address heads of state and to make a declaration: climate change dealt the world a major blow in 2017 through the merciless assault of hurricanes on Dominica and other countries including Puerto Rico, Barbuda, St. Martin and the US Virgin Islands. At the time of his address, Dominicans in urban and suburban areas were just beginning to regain cellular connections to make and receive calls to their loved ones all over the world, because making on-island calls were still difficult or impossible. So tuning in to the radio for the speech was reminiscent of the days my grandparents tuned in at 6pm for the BBC World News. At once striking the chord of vulnerability and perseverance, Mr. Skerrit made an emotional appeal to the developed nations of the UN to be accountable for their contributions to climate change. That was made even more powerful when he declared, in a second UN gathering Dominica’s plan to be the first climate resilient nation in the world. In the days and weeks following the passage of Hurricane Maria, journalists and media workers from all over the world descended on Dominica to profile the devastation and to bring some awareness to what would have otherwise been a more US centered hurricane season in international mainstream media. Through this medium, however, the Prime Minister gave new meaning to the idea of damage control. Dominica symbolically took control of the catastrophic damage exacerbated by more developed nations and declared itself the David against any future natural and man-made Goliaths in this battle against climate change. The Prime Minister’s insistence on making the difficult trek to New York City to deliver this speech, when all communication and transportation was cut off from Dominica, indicated his awareness the international mainstream media was already doing its work to frame the story as one of loss and lack – with destruction amounting to 226% of the country’s GDP. But it was of political and economic importance to establish the sovereignty of the tiny island nation through the declaration of its commitment to innovation. It was important for the Government to own the image of recovery and development very early on in the process, given lessons learned from other disasters around the world, and almost foreshadowing the media coverage with their attempts at political exploitation and cultural misrepresentation that may come in the weeks and months following the storm. I listened to the UN address on my transistor radio, while sitting on my patio looking at the large chunks of my neighbor’s roof strewn over the downed trees. I began writing in my journal some questions about what, when and how we wanted the world to know about our suffering and trauma and why it seemed less important to speak of the trauma than to speak of the recovery. I wondered at which point the narratives about the small island state’s development would include the human impact and not just the ceremonial and performative humanity of the Prime Minister’s tears on the UN stage. As a literary scholar, I spend my career focused on the power of narratives and storytelling and wondered whether, the UN address would actually do the country any substantive good, however noble and well-intentioned. Moreover, I wondered whether the international stage would reinforce narratives of lack rather than create empathy for the nation’s desire for self-empowerment. I thought more broadly of the neighboring islands just experiencing Hurricane Irma and of our now sister island by Maria, Puerto Rico and had a shocking realization that we were now those sad, distraught far away people that we always watched on foreign news. In this presentation, I outline a few other instances of such post-Maria narratives to prompt us to think through the following questions: What are the dominant international narratives about tragedy, aid, recovery and resilience that persist following the storm? What, then, is Dominica or the Caribbean in the age of climate change disaster, if not a spectacle of foreign media consumption? In response, how do local knowledges and local communities resist and redefine the stories that are told in these international spaces? Through a number of examples, including my own experience as a survivor of the hurricane, I hope to show how local narratives about the Hurricane Maria experience allow us to work through Dominica’s rebuilding and redefining of its future despite the interjection of external storytellers at the center of this traumatic experience. Prime Minister Skerrit’s UN address was an early example of numerous attempts to resist narratives about dependency and need by the trauma affected nation. I wonder, in the words of Sara Ahmed, whether the presentation and representation of a “soft nation,” that is vulnerable and penetrable by external forces, is actually being used as a mark of sovereign power in the instance of Dominica, or whether exploiting the affect of our trauma would further lend itself to various types of neoliberal and neocolonial impositions. While Dominicans were suffering, it was important for the world to see that they were not counted out or, even worse, “like Haitians.” Even during the most tragic circumstances, the storytelling about loss, suffering and violence wrought by Maria used the stereotype of Haiti’s suffering as its measuring stick. Once communication networks were re-established, the proliferation of conspiracy theories regarding the passage of Maria and the days of rampant looting immediately following centered on superstitious ideas that we had now become “cursed like the Haitians.” Walking the streets, listening to the radio, or scrolling through social media, we encountered this undying fable of our new life in the shadow of Haiti’s trauma. I understood this moment as a direct consequence of the country’s response to Haitian migrants coming to Dominica following the 2010 earthquake and the Government’s decision a few years after to treat Haitians with suspicion and limit the number of visas and work permits issued to control what one Minister had referred to as “these people.” However subconsciously, the positioning of Dominica’s devastation in relation to Haiti’s history of trauma – even trauma caused from resistance to oppression – was a way for Dominicans to declare their sovereignty and empowerment. To publicly own vulnerability without any point of comparison or cautionary tale would be violating the colonial inheritance of respectability that, even at rock bottom, we seem to hold dear. In the times of trauma, the resistance to dominant destructive narratives manifested through social media revealed the real fractures in our sovereignty and sense of Caribbean unity, but also revealed the quotidian points of empowerment for Dominican people. One telling example is the story of Emerline Anselm, founder of a Facebook based news site called EmoNews. In the weeks following the hurricane, she walked and drove from community to community documenting the stories of Dominicans as they pulled themselves from the rubble and posted them to her social media account. A school teacher with a penchant for journalism, Anselm used her mobile phone to create an international community where average Dominicans could be frank about their experience without the filters of mainstream media. She often dressed in her most casual wear or whatever was accessible in those days of scarcity. There was no makeup. There was no pretense. Her coverage of daily human interest garnered attention eventually from the BBC and other international media houses. But ultimately, her audience was her own people. It was a simple way to let people in the diaspora know that their family members were alive and to give them an accurate sense of the post-hurricane landscape at that time. EmoNews now has its own organization Facebook page and periodically provides follow-up stories on many of the interviewees from the first few months. While the world’s top media platforms like the New York Times, Guardian and The New Yorker steered their coverage of Dominica’s trauma into six degrees of separation from “how does this impact us,” citizen journalists like Anselm, forced the world to look at Dominica, deal with the (accurate) reality our trauma and hear our own voices saying things that had nothing to do with them, but things they had the power to help change. This notion struck me most profoundly when my landlord arrived from Guadeloupe, where he lives, five days after Maria, with a backpack of much needed supplies and a group of journalists, who had traveled all the way from France to come cover the story. They would stay upstairs in the short term rental apartment and I was so happy for the pleasure of some company that I engaged their questions and gave them some details of living through the storm. Talking about my experience and the current state of affairs within a week of the storm, I felt like I was finally given a chance to vent. It didn’t occur to me that I was a subject until one of the other journalists starting taking photographs of me while I spoke. The disorientation that I felt in that moment, especially when my landlord boastfully declared that I was an “important person,” a professor at the national college, surprised me. As soon as they heard this, they all asked questions about the economy, the handling of relief supplies, the Government’ position – complicated questions when I had left my house just once to venture into the street and was still too scared to do anything else. I gave a barely coherent interview and stated my name for the record when asked. Then I went to my journal and wrote about my excitement over their offer of power banks being interrupted by their erection a satellite news transmitter right in my driveway. That night, I read an essay by Teju Cole on the photography of black skin that forced me to reflect on that interaction with the journalists. I finally saw myself as a subject, a body cloaked in the condition of disaster, exposed to the elements of foreign intervention. Similarly, I was contacted frequently on Twitter by platforms wanted to use my live tweeting of the storm experience as click bait or more substantive parts of news items. I did then and continue to now worry about this hypervisibility – how every time I choose to speak, through my activism about climate change, or my Caribbean Studies or Digital Humanities work, that I am now expected to think and speak about Maria. I feel internal pressure – and sometimes external – to be the intellectualizing voice of the experience as a way to advocate for change, much like we are doing here on the panel. And yet, I also stayed up the entire night from September 18 into the 19th, hearing the possessed howls of the madwoman let loose over my home and that of my family and it forces me to consider whether the only advocacy I should prioritize is my own personal healing, maybe at home in Dominica, maybe a bit away from it all. In the end, much like I’ve highlighted in the other examples of Prime Minister Skerrit and EmoNews, the “soft touch” approach to a harsh traumatic present and future, as theorized by Ahmed, is a comfortable, if not satisfying middle ground. To conclude, I return to the UN address by the Prime Minister: the most quoted line from that speech is one that speaks volumes about how Dominica sees itself and how Dominica perceives its future in the age of climate change disaster, “Eden is broken.” Perhaps the most resistant narrative of them all, for better or worse, remains the image of Dominica as the Nature Island of the Caribbean, an image that is now in the aftermath of Maria still being used to sell the country as a tourist destination of choice. There is no place greener in the Caribbean than Dominica. None. I revise that. There was no place greener in the Caribbean than Dominica…. before September 18, 2017. Before Maria, Dominica was beginning to see its long-awaited tourist traffic in the form of luxury and boutique travelers looking for high-end villas with nature and wellness to their heart’s desire, for them to retreat and rejuvenate. New boutique hotels were emerging and through its Citizenship by Investment programme, Dominica’s Government was able to secure investors for more than two five-star hotels, with the earliest opening in early 2019. The research exists, even right here at this conference about how the allure and exploitation of the unspoiled natural landscape that has brought cultural and ecological annihilation of the region, and leading up to the 2017 Hurricane Season. The tourism industry on which the region survives is helping to destroy it, not so slowly anymore. Dominica’s rugged and defiant terrain in the face of a desire for development has made the island a late bloomer in this regard. Dominica has uniquely tapped into the exploitation of eco-tourism as a catch phrase that, with all best intentions and long term goals, markets natural resources and sustainability as consumer goods rather than real community accountable and socially conscious tools of development. Now, after the storm, it is concerning that this narrative of the Garden of Eden may be even more pervasive than before. A full page image and Sunday report in The New York Times, coverage in numerous international papers and magazines, especially articles written by white European residents or visitors, and a full campaign from the Ministry of Tourism to “Rediscover Dominica,” in the dreadful Columbian sense, through “voluntourism” campaigns with hotels and international mission organizations, all confirm that the Garden of Eden will grow again, if only for you to pick its fruit, and pick and pick again. It worries me that the trauma has already been repressed in exchange for the narrative of development. It should worry those of us committed to a more humanistic understanding of the impacts of climate change that the Garden for our sustenance and sustainability is the object of excavation and consumption for luxury, when we need its preservation the most. Perhaps it is my naiveté, my intellectualism, my post-traumatic stress that makes me reject and resist the narrative of Eden in exchange for the narrative of home – a more livable place committed to environmental sustainability, community accountability, and planetary responsibility. But about half the country is still without power, running water supply is still inconsistent, I still don’t have broadband Internet at home, and the mobile data doesn’t work after 9pm. Maybe I’m thinking too far ahead. Maybe the Prime Minister is, too.